Although we started out with the smallest guest list in years, we ended up with the most well attended Seder that we have ever hosted. Thanks to technology, tradition and trust, we had more people at our Seder table than ever before. Although our family is spread all over the globe, we managed to bring them together with the help of a few computers, an iPad and some patience. We Skyped them in – my parents from Cape Cod, my nephew and niece from the Boston-area, and our daughter from Ecuador. 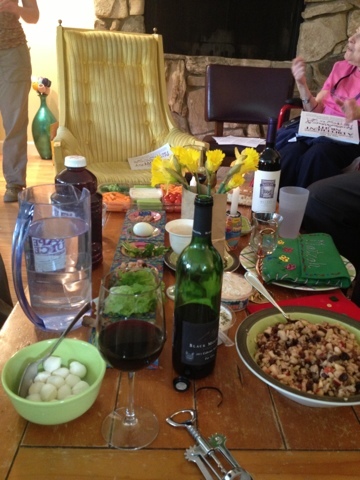 My sister and I coordinated a bicoastal seder, though the finicky internet ended the experience far too early. When her turn to read, we even held up our haggadah for our South American-based student to participate. The world is so big, but technology joyfully makes it feel so much smaller. And since our family is spread out, holidays no longer need to feel so separating. Technology has allowed us to double the size of our Seder without having to set more places or even cook more food. Our modest home stretched to accommodate the next group of visitors. 2 million Israelites came by to share the experience. Their experience. Reading the Magid (story) of their exodus, we felt their presence wih us. (Here’s the math: 603,550 Israelite men of fighting age counted in the Torah. Double it for similar aged women, give them an average of 2 kids each, add in the old, ailing and disabled, and we get close to 2.5 million.) Of course, from an historical standpoint, it’s unclear if the Exodus actually happened as reported. Still, the mythohistorical Israelites came over for Seder dinner, but thankfully they didn’t eat. We went interfaith for parts of our Seder, welcoming in 3 million undocumented foreigners living in the state of California. They live in terror, especially when they find themselves victims of crime, because they are fearful that going to the police will lead to automatic deportation. This is a terrible way to live, for any human beings, let alone people who are mugged, sexually assaulted or forced to work without pay by unscrupulous slave-driving bosses. Using a Haggadah supplement produced by Reform CA, a group of Reform Jewish Rabbis and laypeople, we committed ourselves to standing up for the stranger. Words from Torah became the rallying cry for us; the Trust Act, a piece of legislation before the California Assembly, serves as our vehicle to combat this focused oppression. Even though they left with their bellies empty – apparently not everyone likes matzah and gefilte fish, the cry of the 3 million resounded throughout our Seder. We spoke with the women of Israel who monthly pray at the Kotel (Western Wall), in hopes of opening up this Jewish site to prayer and ritual as we liberal Jews experience it. We talked with Palestinians and Israelis – a passionate bunch they were – who want nothing less than normalized relations as members of two states living side by side in peace. It would NOT have been enough if only seven of us sat around the coffee table on living room couches to read through the Haggadah. The Seder is meant to be shared – with far flung relatives, with our ancient ancestors, and with modern victims of oppression. Because only seven of us ate, we had leftovers for a week. More significantly, with the house cleaned up and the Seder plates put away, we still carry with us the extra responsibility – burden?!? – of our new friends.